There’s more to space combat in Starfarer than nearly-obsolete front-line sluggers like the Onslaught. 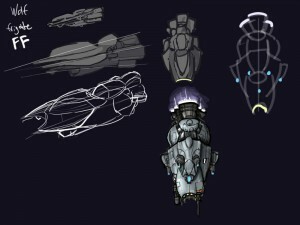 Meet the Astral class capital-ship carrier: a modern, refined platform for supporting squadrons of small fighters and bombers such as the Dagger torpedo-bomber you can see below. Escorting the Astral is a nimble Wolf class frigate. This Astral carrier has some top-of-the-line point defense systems on its starboard side while the port has some nasty repeating torpedo launchers. Once you get past the escorts and fighter-bomber cover, you’ll have to be sure to choose your approach carefully — and that’s before dealing with the full-coverage shield. Astral-class carriers should not be taken lightly. 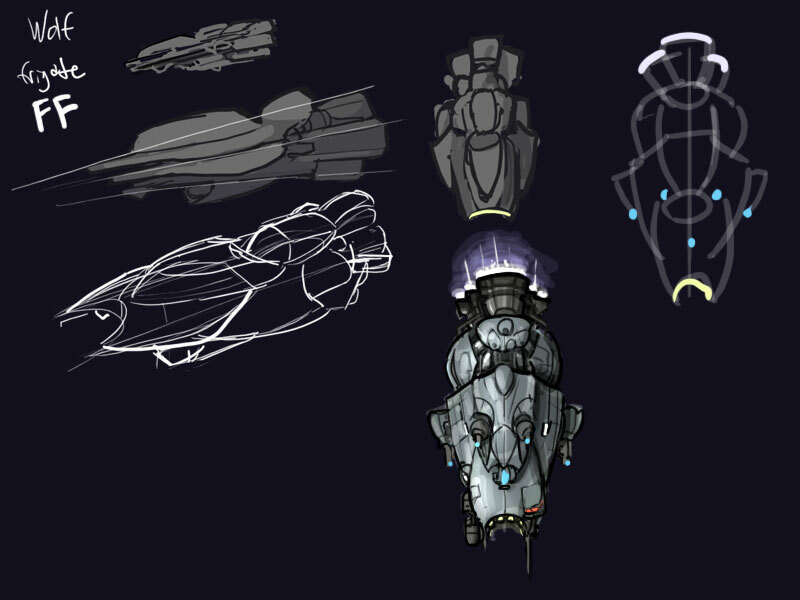 What follows is a bit about how I went about designing the modern ship classes of Starfarer along with some concept sketches for the Astral and Wolf. My goal is to show visually a whole different design philosophy behind the ‘modern’ ship classes versus the ‘old’ ship classes. I should note here that these are broad categories; there are many variations within each, and these rules are just used as general design guidelines. 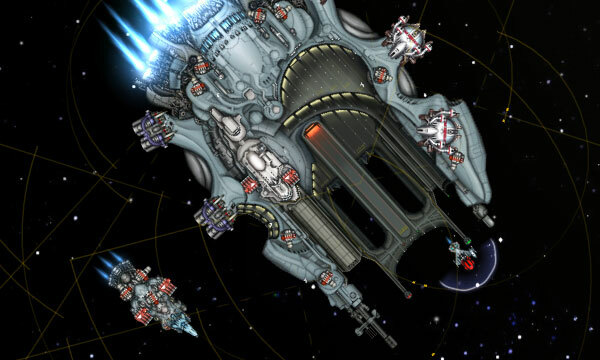 That said, old ships like the Onslaught tend to rely on heavy armor and kinetic weapons while newer ships like the Astral and Wolf rely on (relatively) greater speed, full-coverage shields, and energy weapons. These ‘new’ ships are sleek rather than blunt, bulbous rather than angular, and use cool bluish tones rather than warm orange-red tones like the old ships. No doubt one’s idea of what modernity looks like changes with time — why, back in the 80′s boxy stuff in ridiculously bright colors was considered modern-looking. But this is our made-up future and so long as style is a consistent indicator of what a ship design is about, the purpose will be served. 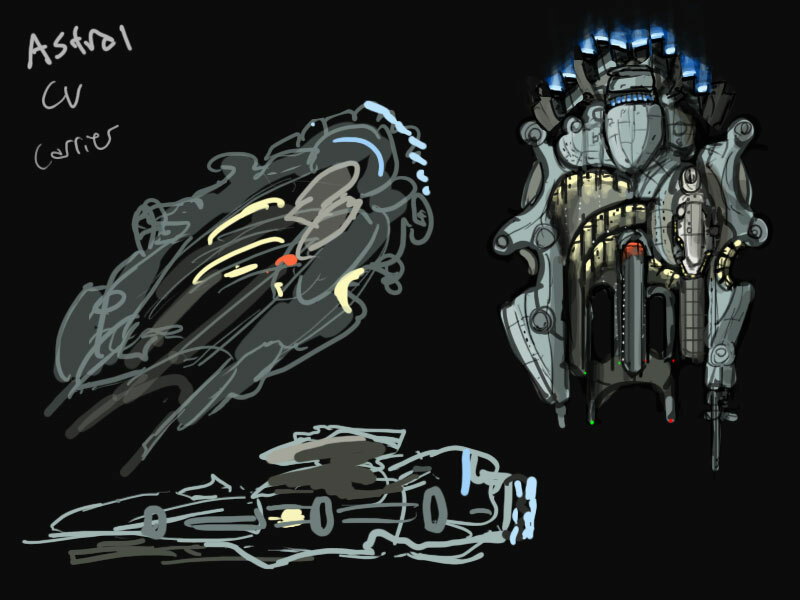 This was one of the very first ships I drew for Starfarer, so I wasn’t quite as sure how to approach it as I was for later designs. For example, I noticed just now that I neglected to leave open slots for weapon hardpoints and turrets! Oops. Anyway, I went for a forward-oriented design with converging lines to get an aggressive ‘hunter’ look. I’m not sure quite why, but the Astral design is what immediately came to mind upon being asked to draw a space-carrier. I just like the idea of all these open bays and launching strips protected by arms bristling with point-defense systems and sensor arrays. The asymmetrically mounted tower-like bridge is a clear nod to real-life naval aircraft carriers. Funny thing for pixel art, a rather large amount of this ship was painted using soft brushes then touched up afterward pixel-by-pixel — well, not in a strict sense, as I switched between tools quite often. Doubtless this mixed approach drives very traditional pixel artists nuts, but I revel in that! And honestly, this rounded, bulbous style demands, well, modern drawing tools. Could you imagine doing all those curves and shaded areas by hand, pixel by pixel? It’d be miserable! But then I say that and the next minute I’m drawing swathes of ridiculously detailed pipework, like all that you can see around the engines at the back (which you can see on the Onslaught as well). Thing is, I really really like drawing ridiculously detailed pipework for some reason. Everyone has a thing they like to do that no one else likes, right? « Spotlight: Fighters, pt.2, and More! This entry was posted on Tuesday, January 25th, 2011 at 5:40 am	and is filed under Art, Development. You can follow any responses to this entry through the RSS 2.0 feed. Both comments and pings are currently closed. Looks fantastic, looking forward to seeing it in action. I must say I’m more partial to the Onslaught’s design. Best pixel designs I’ve seen for a space game by far. Just wanted to say that the theme of modern vs. old is a really cool design philosophy for making uniquely themed ships (As was the idea of freighters being modified for the purpose of war that you guys presented in another blog). Gosh, that art looks beautiful.